Great software applications seldom happen by accident: Wise design decisions are the key. Yet many application development teams only design for one, two, or three of these qualities, and others have strayed from design altogether as teams, distracted by shiny new technologies, methodologies, and platforms, fail to engage design principles and talent effectively. Is your business demanding more innovation? You must respond by rising above mediocrity to deliver great software, and to achieve this, you must balance your design to provide seven key qualities: user experience, availability, performance, scalability, adaptability, security, and economy. 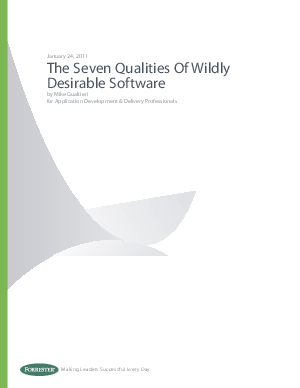 Boost your commitment to design and design for all seven qualities to create better software, faster.